This is one of my basic recipes that has come in handy for me on countless occasions. 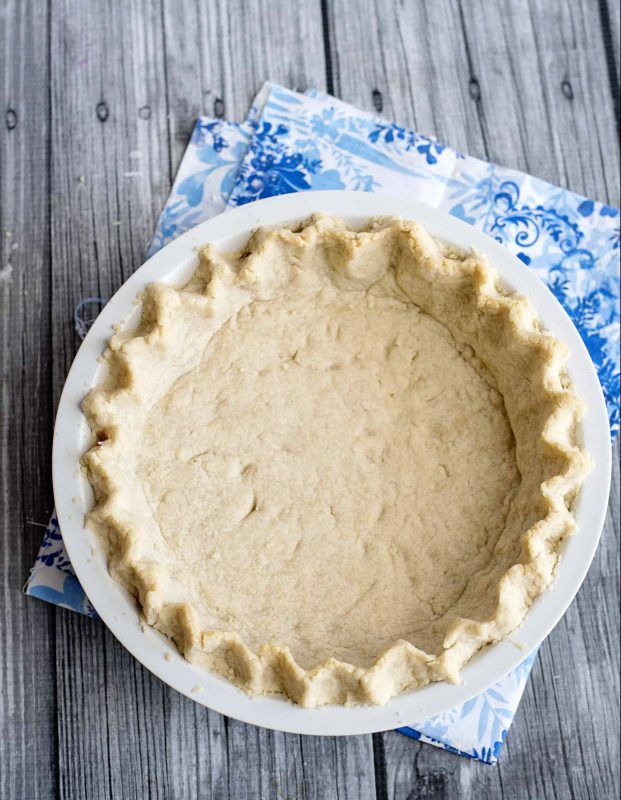 When you want a homemade crust or just don’t have time to run and buy a store-bought one, this pie crust is the perfect one. It’s flaky, very lightly sweet, and comes out perfect every time. What’s more, it’s not the least bit fussy! 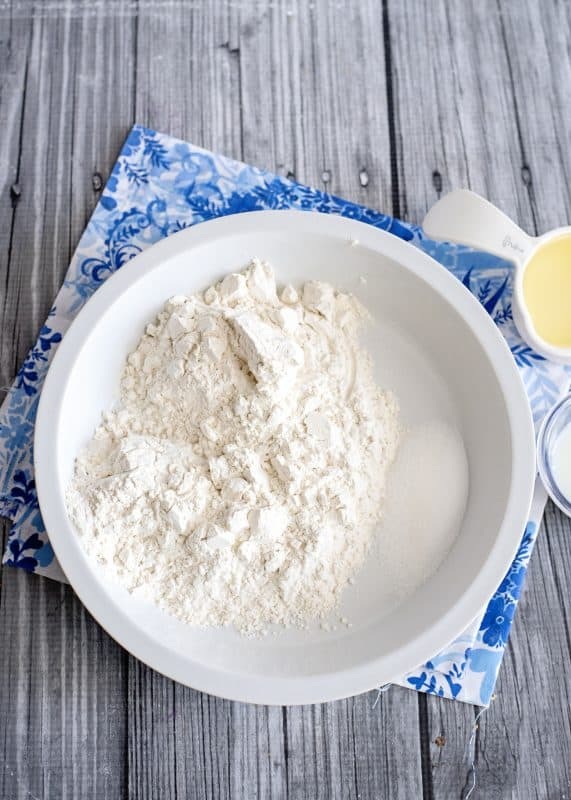 Simply add in the ingredients directly to your pie plate, stir them up, and pat them out. It doesn’t even dirty up a bowl! This Easy Peasy crust is the perfect accompaniment for all of those wonderful old fashioned pies – that I’ll be sharing at the bottom of this post! 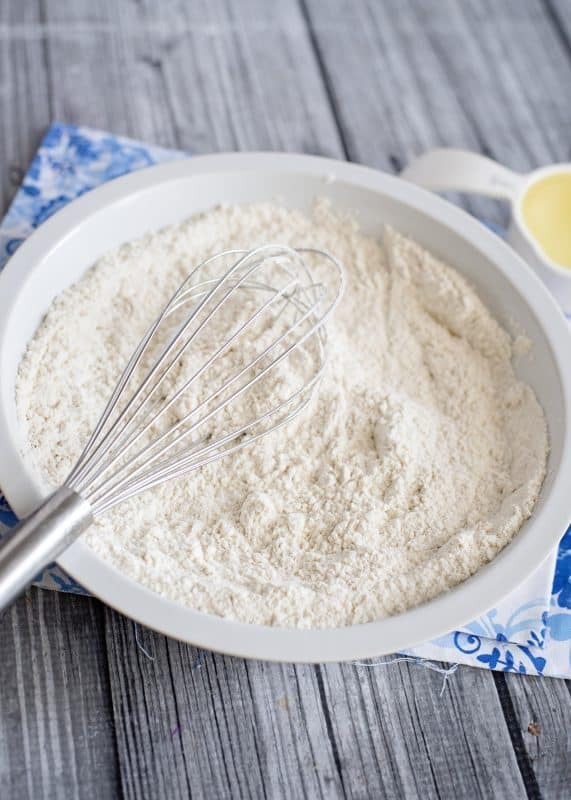 You will need: Flour, sugar, salt, vegetable oil, and a wee bit of milk. Now add your oil and milk. Stir together until it kind of forms a ball or “wad”. I guess “forms a ball” sounds better though. GREAT JOB!!! (can you tell I’m a mother?). Now just pat that ball out, first to fit the bottom of your pan, then keep on patting until it goes up the sides. Note: To make a thick crust like this with plenty of dough to flute the edges, double the recipe. VOILA! 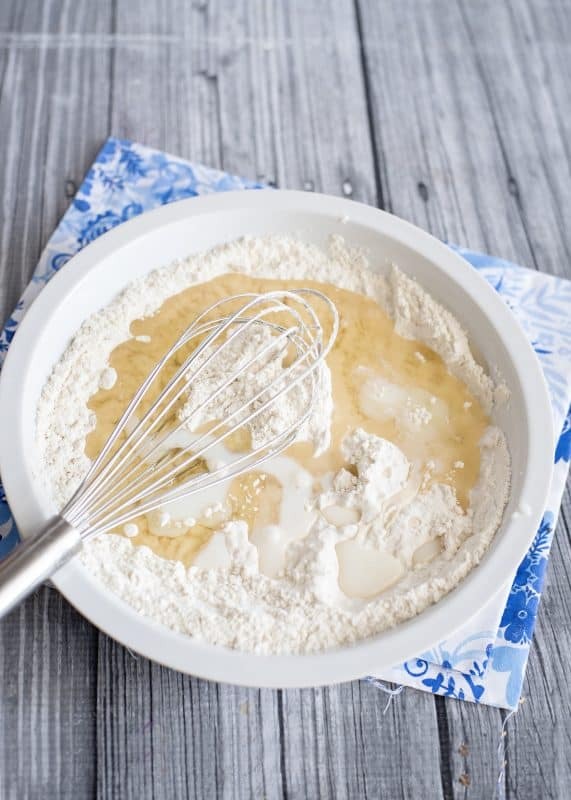 Mix in pan pie crust! All ya gotta do now is bake at 350 for about ten minutes and you’re ready to fill. Unless your recipe instructs using an unbaked pie crust. In that case, you’re good to go right now. Now you didn’t think I was going to give you a pie crust and not give you something good to put in it, did ya? Puleeeeeze! You know me better than that!!! 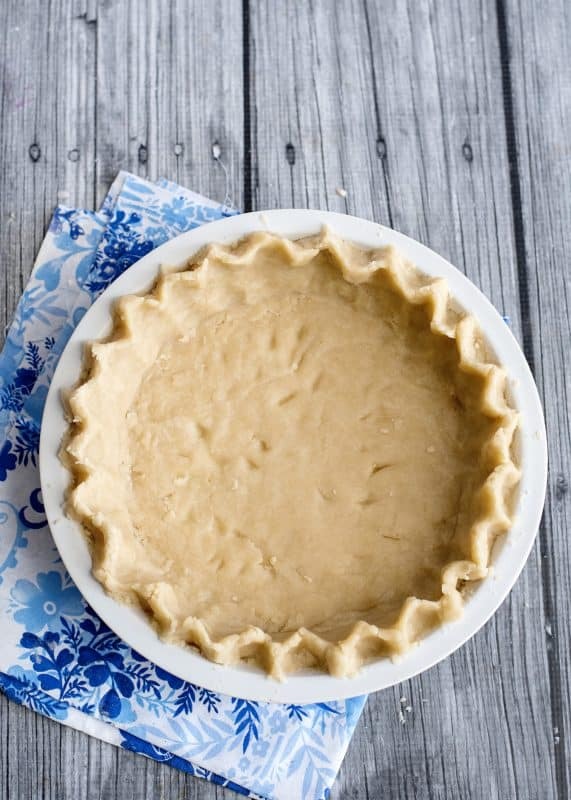 Print off this Easy Peasy Pie Crust Recipe below and save it to your files! Stir in milk. Slowly add oil, still stirring and stopping with a good dough forms (may not need all of the oil). Mix well with a fork and pat out to fit pan. Bake at 350 until brown, usually about ten minutes. If recipe calls for unbaked shell, skip this step. 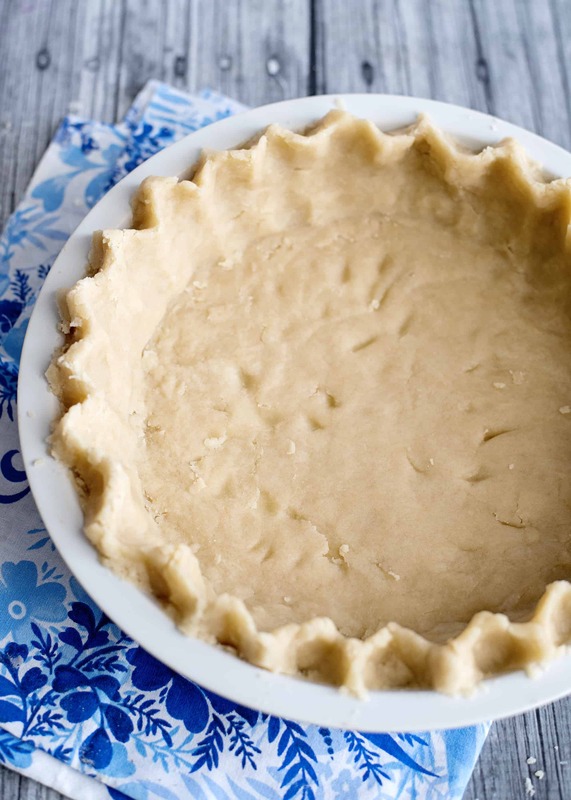 To make a pie crust as pictured, double the recipe. In the desert there is always sunshine but for growth, you need rain. Click photos below for some great old fashioned pie recipes! Gosh, that does sound easy. I never make my own pie crusts because I don’t ever feel like the mess on the counter is worth it. But this. . . this is great! Wow.. I just happen to have a Southern Plate cookbook! I got it this morning. Thank you so much Christy and thank mama for getting it to me so fast! I will learn to make pie crust now. First stop is Lemon Meringue! Hey Donna! It really is easy and just simple and good. I’m with you on the mess of a traditional pie crust. I guess I’m just too lazy :). If I want a “pretty pretty” one, I’ll just go buy one of those pilsbury roll out deals like I use on my apple pie! This post is a bit of a cop out, I had planned on posting the crust and the pie at the same time but found myself a little under the weather. I am hoping to still get the actual pie up today though! Bill! WOW that WAS fast! Maybe I should give her a bonus? Hmmmm a bonus percentage of what she makes right now….yeah I can definitely afford that considering I am having a hard time getting her to even take the money for shipping of the cookbooks. Did you know she has mailed out about three hundred so far? Lemon meringue is my absolute favorite pie. My second favorite is coconut. 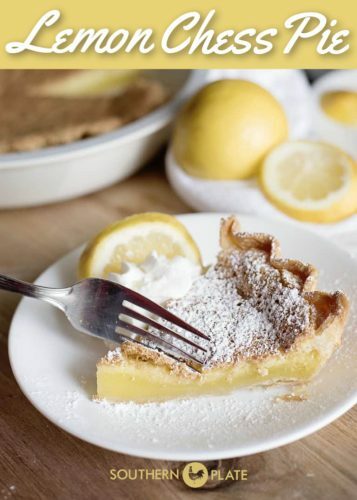 If you like lemon meringue, you will really enjoy lemon chess pie, which I am posting a tutorial for next. I also have a tutorial done for a meringue which will be up soon! If you need a recipe for lemon meringue pie before I get around to posting it, just give me a holler!!!! But seriously, you will really enjoy lemon chess! I can’t wait to try this. 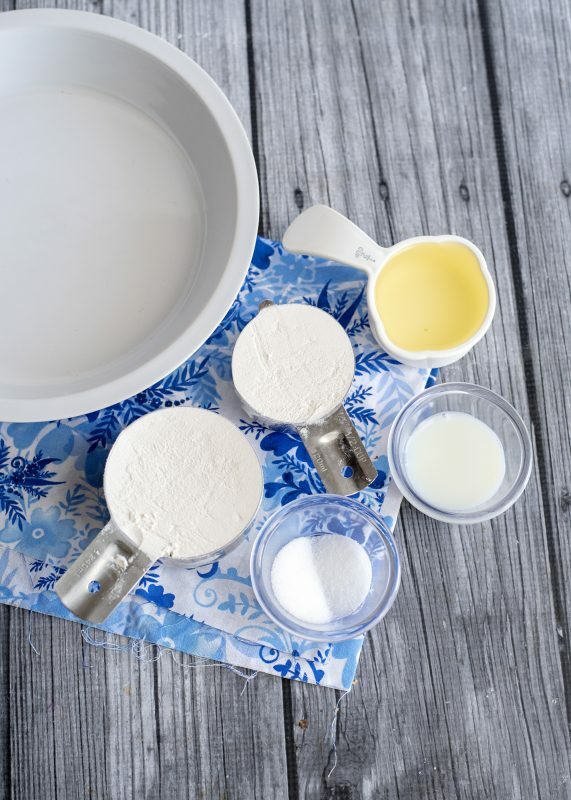 One question…is this only for pie shells that you bake first, then fill. Can you use the recipe for say Cherry Pie where the filling and crust usually bake at the same time? Keep up the good work and sweet dreams! This is SO freakin’ cool. I mean REALLY cool. I’ll have to use this for my double layer pumpkin cheesecake pie for Thanksgiving! April, I am officially drafting you as the Southern Plate cheerleader for the day!!!! Here are your pom-poms! They release the scent of magnolias when you shake them!!!! Thank you!!! I am so glad y’all like this!! you know, it seems like every time I am hesitant about a recipe (I felt this one might be too simple for anyone to really care about), it is always so well received! Thank you!!! I hope to have my pie up in the next few hours! Its an easy one, too! That looks simple enough! I love making my own pie crusts, but often shy away from it because I don’t want to dirty a pastry cutter – those things are so annoying to clean! I’ll have to try this. And I’m so excited to see your lemon chess pie. I’ve seen many recipes for chess pie, but never been brave enough to try it. Yup, this is definitely the pie crust for when you’re feeling a bit lazy. Isn’t it funny how we say we’re feeling “lazy” and that is something we only say on the days where we have worked like a mule all day? LoL! Sometimes you just deserve to take the easy way out! I bet your pie crusts are AWESOME Though!!! Oh, and honestly, I think a chess pie is just about one of the easiest pies to make. The hardest part is separating the eggs, that’s it! Rah, rah, rah pie crust quick and easy in a pan! We are a fan! Lame, I know, but the pom poms got me all excited!! You know cast iron skillets are actually counted as heirlooms? I was thinking I’d get two new ones and use them really well, which gets them good and seasoned, and give one to each child when they grow up. Because…southerners are weird that way. YAY! You don’t get much quicker or easier than this! You are so awesome and I love your blog! Cool for the new cast iron skillet. I have mamas two iron skillets and pot. I rarely cook in anything else. When I was about 7 or 8 I saw those dirty old skillets and decided I would clean them both real good with SOS pads. My mama would be so proud that I got off all that old black stuff and make-em shiny. I took them outside and used the garden hose since I didn’t wanna make a mess inside. I proudly took them to her when I was finished and proclaimed my good deed. I don’t know why I remember it.. maybe it was that horrified gasp that burned it into my memory. That looks so easy and one dirty dish you gotta love it. Is that a cast iron pie plate???? holy guacamole i would love one of those. I love my cast iron skillet i use it for cornbred, casseroles and pineapple upside down cake. Thanks for the easy recipe. I know this was posted originally in September but I had not been graced with finding this site yet so I am asking a question now. I hope its not to late but can I get a recipe for a pineapple upside down cake baked in the cast iron skillet. I know this has to be amazing. Its so great to have you here!! I have a recipe for pineapple upside down cake on here but will put it on my list to modify it a bit and try to get it up here for a cast iron skillet. Also, check out my apple skillet cake if you get a chance. It was from my husband’s Granny Jordan and is just to DIE for!! OMG that is so my speed let me tell you!! What a great idea! I have been using this recipe for YEARS! 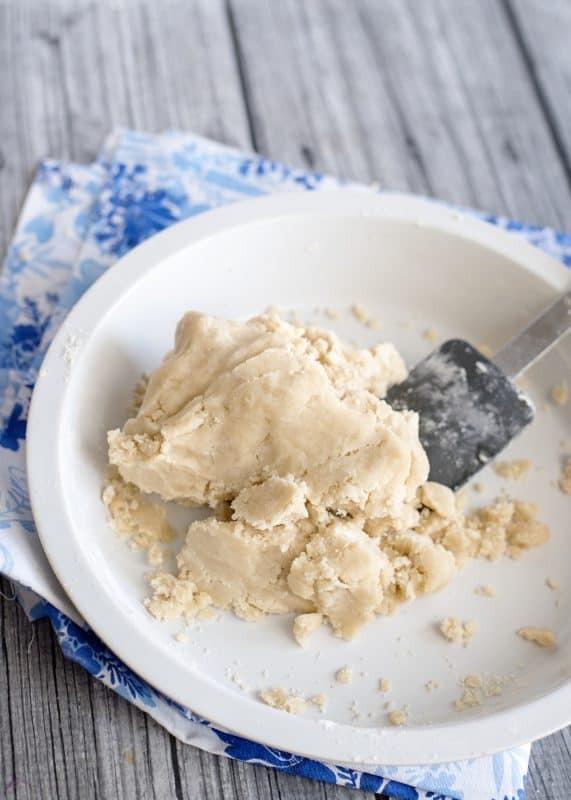 I first started using Betty Crocker Pie Crust Sticks… but they were expensive and we were VERY poor, so I was thrilled to finally have an easy recipe for pie crust. I have made literally zillions of pies and this recipe has never failed me. The only difference is that I have always rolled mine out between 2 sheets of waxed paper. If it tears it is easily mended with your fingers. Since I don’t care for the grocery store pie crusts, I’m been searching for an easy but very tasty pie crust. This is it!! I used this crust for a pecan pie and it was the best pecan pie I’ve eaten in a long time. Of course, I used the pecan pie filling recipe from the Southern Plate recipe book!! I made this pie crust and it was delicious and soooo easy. It will be the one I always use. My girlfriends want it now! I was making a one-crust peach pie (where you make a streusel and place over–and I just placed in the pie pan, and it’s baking. I’m hoping it was not necessary to bake the crust first. 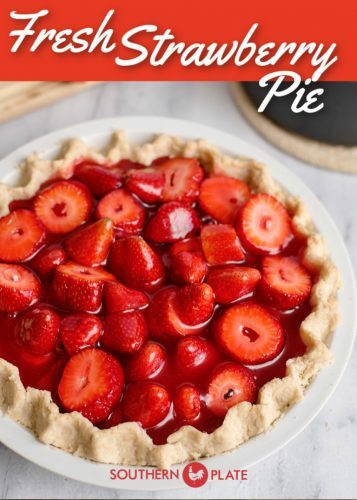 Do you recommend baking for 10 minutes prior to using for any pie? Thanks. Do you use plain or self rising flour in this crust. This sounds so easy…can’t wait to try it with the coconut pie you posted today. That is one of my favorites too and have been wanted a recipe for one. Thanks. Whoops…I see now the plain flour in the picture up at the top. I guess that is what you use. Could you use self rising? I made this pie yesterday, it’s wonderful. Love the pie crust, it’s a keeper. Your recipes are fantastic, honest to goodness food with ingredients you have on hand. That’s the way I’ve cooked for years. Thanks so much!